Girona manager Eusebio Sacristan was not the least bit impressed by the referee’s decision to hand Bernardo Espinosa a red card in their 2-0 defeat to Barcelona. Sunday evening’s Catalan derby, that had initially been planned to be played at Miami in the United States, was instead hosted at Girona’s Estadi Montilivi as the home side looked to pull off an upset against their local rivals. Instead, it was Barcelona who took the lead though when Nelson Semedo scored in the ninth minute of the game. Girona gave Barcelona a good run for their money, however, with star striker Cristhian Stuani testing Blaugrana keeper Marc-Andre ter Stegen three times. But Eusebio’s side soon saw defender Bernardo dismissed for two yellow cards after the break with Lionel Messi then wrapping up the three points for Barcelona with a lovely finish in the 68th-minute. “The sending off really hurt us because we were doing really well even though we were behind,” said Eusebio, according to Marca. “It was a dubious decision, as neither of the yellow cards was clear. I’ve always trusted the honesty of the referees. “It’s a decision that has to be weighed up more. There was a lack of consistency. “We wanted Barcelona to have to beat us 11 vs 11. 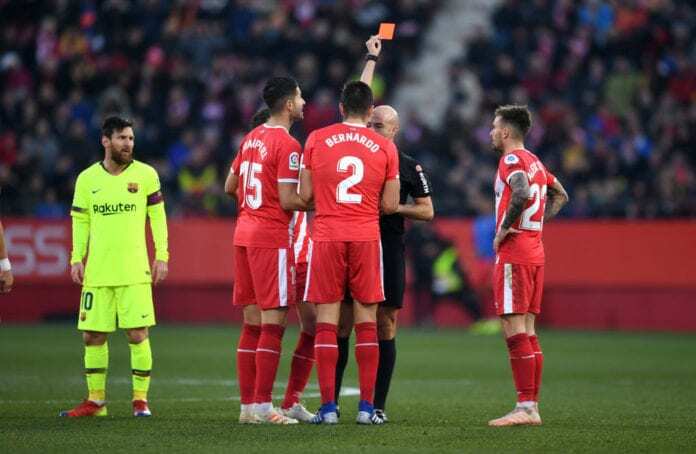 The second yellow card came for Bernardo when he fouled Luis Suarez, which proved to be a major setback for Girona in the early stages of the second half. But refereeing expert Andujar Oliver doesn’t believe that the Colombian should have been sent off in the first place. “It’s a simple foul,” said Oliver. “You can’t punish a player and send him to the dressing room with two yellow cards for a challenge like this. Girona will now turn their attention to Thursday’s return leg against Real Madrid in their quarter-final Copa del Rey clash. The Catalan side need to recover from a 4-2 first leg defeat against Real if they are to book a semi-final spot in the competition.